Steele’s Construction and Steele’s Design Team took an outdated home and created a relaxing oasis. When the Steele’s Construction and Steele’s Design Team family first saw this house, they were blown away by the lake view. Being situated near a cove allows the building to have a 300 degree view of Lake Hickory. The views were break-taking, but the kitchen was out-dated and in need of a new look. The team completely redid the layout of the space, providing the husband, who has a passion for cooking, with a much better experience, allowing him to look at the lake as he creates his meals. This kitchen is completely outfitted in Wolf appliances. Wolf has been making the highest-quality appliances for 70 years, helping direct trends and define luxury. 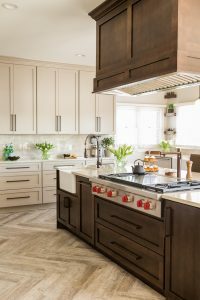 This kitchen features a full 30-inch refrigerator and a 30-inch freezer, providing plenty of room while being disguised in custom cabinetry. A large teppanyaki grilling surface opens up many possibilities for cuisine. Two wall ovens aid in the preparation of large meals. Because the family entertains often, the team added two dishwashers, with a design detail that makes the section pop: the team flowed the durable and stylish quartz half way down the side of the end of the bank of cabinetry, and added a paper-towel holder. Function meets beauty here. The television enclosure makes the flow of the upper cabinetry seamless, and allows the cook to watch television, like news or cooking shows. 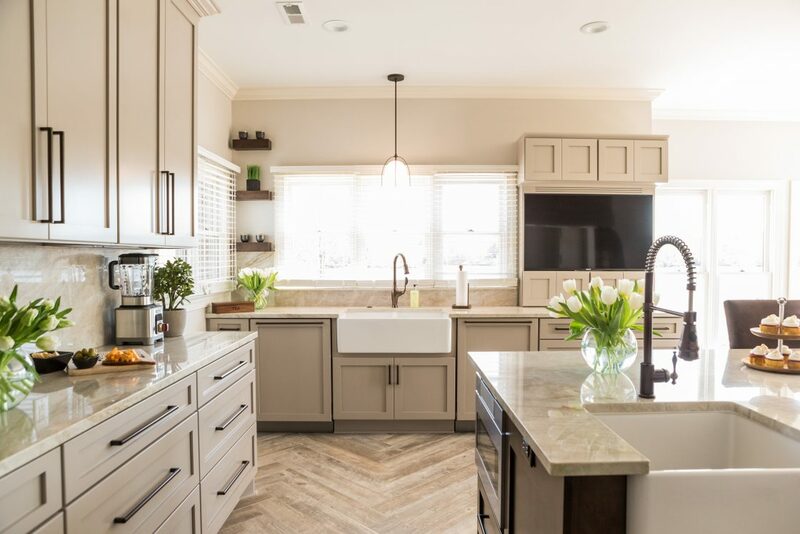 An oversized island in the center of the space houses one of two farmhouse sinks. High-end, industrial sized faucets improve the functionality of these sinks. The team designed a custom oven hood, which was then built by their manufacturer. This seamlessly integrates with the style of the kitchen while being incredibly functional. The kitchen wouldn’t be complete with out a customized pantry. The team took into account the needs and habits of the family and created a pantry that suits them perfectly. Every detail was critical. Perfection is expected and required. A custom spice rack demonstrates the level at which Steele’s Construction works to make their client happy. The family has children, and so the team added a homework space that’s perfect for after school snacks, conversation, and work. An amazing tile floor was selected by the lead designer to elongate the space. A herringbone pattern is very successful in opening up the space, as it leads the eye out to the lake. This home remodel also includes an amazing spa-like bathroom remodel, as well an overhaul of the outside. A large steel beamed porch will add to the luxury at this lake side retreat. Owner Tim Steele is finding this next phase of remodeling to be delightfully challenging and we can’t wait to share it with you! Be sure to check this space in the next issue to see the next step of renovations. This team would love to work with you to create your dream space. Find out more at steelesconstructionllc.com and steelesdesign.com, or by calling (828) 322-8011. Their offices are located on Highway 127 North in Hickory.